I visited Frank Lloyd Wrights home of Taliesin outside of Madison, Wisconsin in the summer of 2016. I never knew much about FLW but fell in love with his work after that tour. 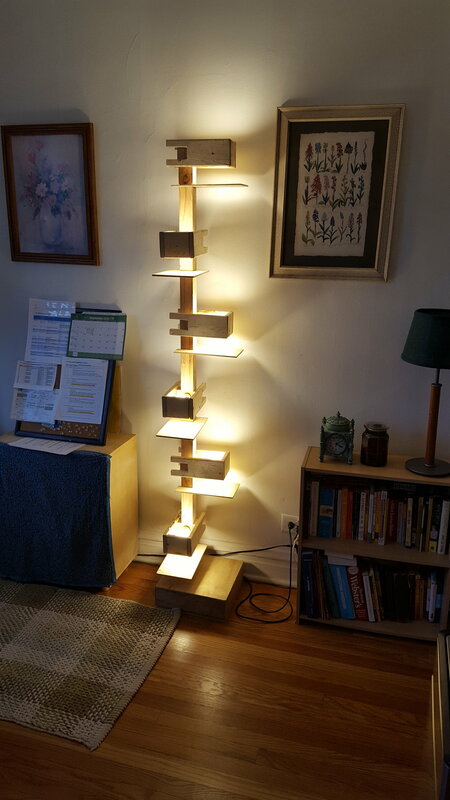 So much of his design was so unique, yet still modern, but it was this one odd, tall, wooden lamp that really caught my eye. Turns out there were several of them throughout the home, each one slightly different from the next. Here is the one I really liked. So after this trip I built one lamp but I don't think Frank would have been too happy about it. There were a lot of areas that needed improving. For one, I used cheap Home Depot wood to make the lamp and I didn't even stain it. It was meant to be a proof of concept more than anything but I still wanted it to look nicer if I was going to put it in my home. So I decide I would use nice wood. 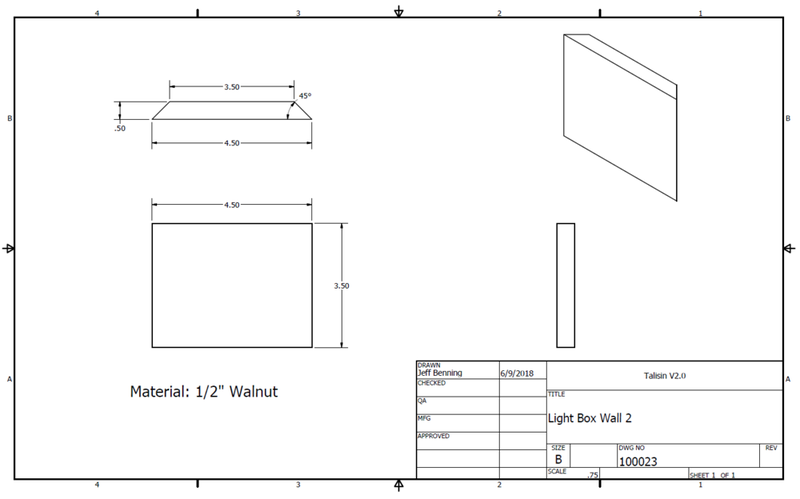 Walnut, to be exact. Second, my light needed a little redesign. If you look in the picture, you'll see that there is a flat diffusor below each light box. I built my light this way but found that if you looked down at the lights on the bottom, you would look directly into a bright light bulb. Kind of annoying. The confusing part was that there were multiple lamps at the Taliesin house and some had the diffusors on top, some on the bottom. I don't know what Frank was thinking but one is clearly better than the other. So I decided to put the diffusors above the lights so you didn't have to go blind looking at it. Lastly, I wanted this new lamp to be smart! I thought it would be cool if each light was controllable individually and to make it better, I wanted it all to be controllable from a smartphone. More on that later. The design was going to be mostly the same as V1.0 with some subtle changes (and the whole Bluetooth thing). There would be 6 boxes, each equally spaced, but now the diffusor would go above the box instead of below it. It gets pretty annoying looking at the lamp only to stare straight into a 60 watt bulb. 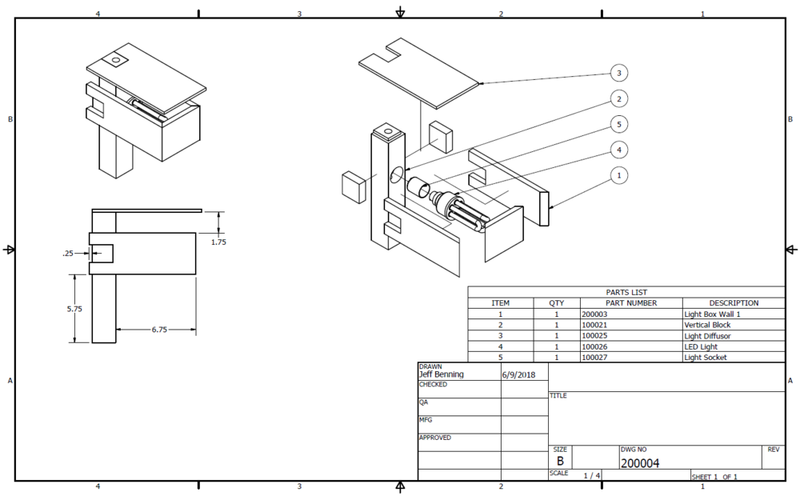 So here are the CAD files.